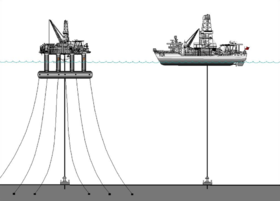 Semi-submersible drilling platforms and drill ships are connected to the seabed through riser pipes. Riser pipes can be thousands of feet long. At the ocean floor sit blowout preventers, to manage the pressure of the oil well. Special ships, or floating platforms, called semi-submersibles several acres big, are used to drill for oil in the deep ocean. These drillships and drilling platforms have engines that automatically keep them in one place on the water, so they can drill a straight hole, and not damage the drilling equipment by drifting. The drilling platform used on the leaking well was called the Deepwater Horizon. A riser connects the drillship to the ocean floor. The riser is a pipe, sometimes more than a mile long. Running through the riser is the shaft of the drill, and a fluid called drilling mud. Drilling mud keeps the drill bit cool and lubricated, and it washes away fragments of rock as the drill breaks through the ocean floor. The weight of the mud also pushes down on the oil, which is pushing up. What makes the oil push back up the well? Keep reading on the next page to find out! Drilling mud is a non-Newtonian fluid, and it reacts differently to pressure than other fluids. Make your own non-Newtonian fluid: oobleck! Record oxygen depletion in the delta? Who Says Theater and Science Don't Mix?